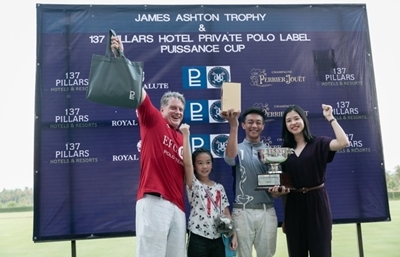 The annual 137 Pillars Polo Puissance Cup was held alongside the James Ashton Trophy on 16 and 17 March for an exhilarating and fun weekend of the highest quality horse polo, food, drinks and entertainment. 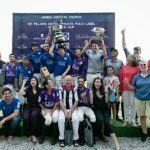 The 137 Pillars Polo Puissance Cup and James Ashton Trophy takes place each year at Polo Escape in Pattaya, Thailand. The outstanding polo retreat houses 23 lodge rooms and villas, an infinity edge swimming pool and Jacuzzi overlooking the polo field, a rustic restaurant and bar, as well as a tennis court, gym and a very innovative outdoor cinema. The full-size polo field at Polo Escape is easily one of the very best in the region, and was designed by Alejandro Lavista Llanos, Argentina’s prominent polo field engineer and consultant. There is also stabling and paddocks for over 100 horses. This year’s 137 Pillars Polo Puissance Cup and James Ashton Trophy attracted some of the top names in horse polo including the Kalaan brothers – Uday and Angad, Fernando Rivera, Santiago Lujan, Nicolas Pieroni and some of Thailand’s top home-grown talents and upcoming stars such as Nutthadith Sila-Amornsak, Satid Wongkraso and Cliff Punyanitya, to name but a few. Sponsors for this year’s 137 Pillars Polo Puissance Cup and James Ashton Trophy include Perrier-Jouet, Royal Salute, MaxWin, Kuppa, King Power and Lotus Arts de Vivre.